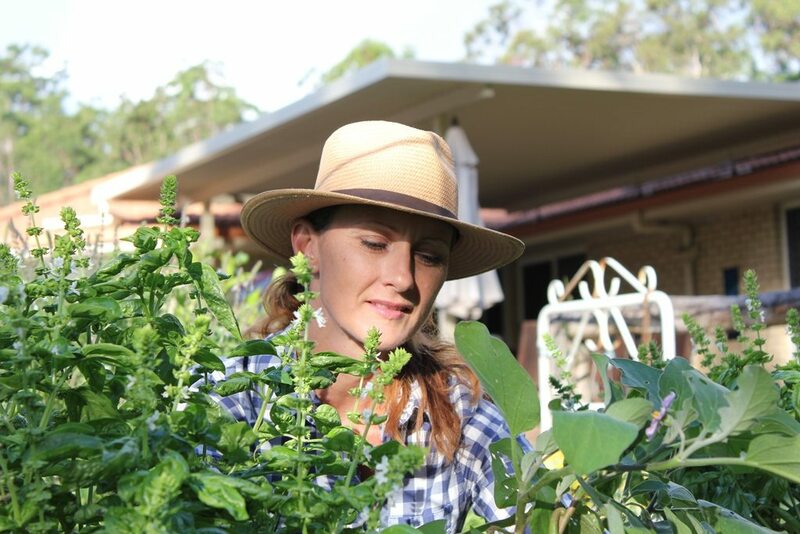 In January each year The Ginger Factory hosts the ‘Ginger Flower & Food Festival‘ at Yandina on the beautiful Sunshine Coast. Go Organic – no chemicals or synthetic fertilisers. Our gardens and ourselves are part of an ecosystem which is a community of organisms working together. To maintain a balanced ecosystem we need to ‘work with nature, not against it’. 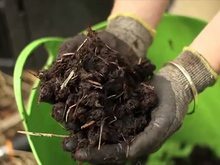 Establish Composting and Worm Farm systems – provides a valuable resource for your garden while reducing landfill. Seasonal growing and growing for your climate – grow annuals for your current season, eg warm or cool. Also grow all plants that suit your climate, eg cool, temperate, sub-tropical, etc. Your plants will be healthier and happier growing in the right conditions. Polyculture or Intercropping – growing many plants together, rather than just one species of plants, to produce high yield and use garden space more efficiently. Some ideas are…vertical growing of cucumbers, with beans, celery, lettuce and dill. Intercropping also reduces deficiency in soil and reduces pest & disease problems. Consider growing plants together that won’t compete for water, nutrients or sunshine. Companion Planting – plants grown together to support each other’s growth. They provide shade, a wind break, natural trellis, ground cover, assists with reducing soil diseases or encourage beneficial insects. Companion Planting also promotes bio-diversity. Marigold grow with tomatoes, cabbages, cucumbers, roses. 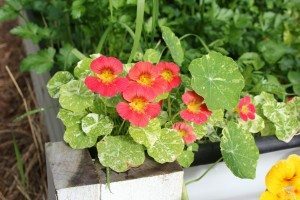 Nasturtium are good for many plants. Grow them as border and free flowing plants throughout the gardens. Basil & Tomato are also grown together…Yumm!! Examples of good companion plants are nasturtium, marigold, calendula, dill, sage, parsley, basil, sunflowers, rosemary (deters cabbage moth) borage (attracts bees) and tarragon is a good all rounder to grow throughout gardens. Support Species – these are plants that help to support soil & garden health. They are well used in permaculture gardens as they have more than one use. A few of my favourites are Comfrey, Pigeon Pea, Lemongrass, Arrowroot and Nasturtiums. Comfrey is an excellent source of potassium, which is an important nutrient needed for flowering and fruit production. 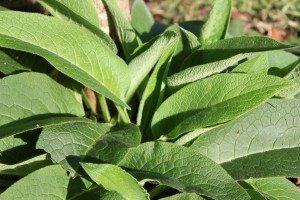 Blood & Bone is low in Potassium (unless you use a product with added Potash) so used together Comfrey and Blood & Bone are fabulous soil improvers and activators in Compost! Pest & Disease problems – having healthy soil reduces pests and diseases in the garden. **Permaculture Principle – Use and Value Diversity – work with nature not against it. **Encourage bio-diversity – attract birds, frogs, lizards and spiders to the garden. **Plants that attract good bugs and repel pests – rosemary, thyme, oregano, alyssum, calendula, cosmos, queen’s anne lace, dill, fennel, lavender, marigold, marjoram, mint, chives, coriander. **Parasitic Insects are so small they usually cannot be seen. They feed on sucking insects and are important helpers for our gardens. **Diseases – Examples are leaf spot, mildew, sooty mould, black spot, blight, moulds. Remove all infected foliage and place in plastic bag 4 weeks. No watering foliage at night. Hygiene is very important for reducing disease problems. Disease pathogens are spread by humans, machinery, animals, water and insects. 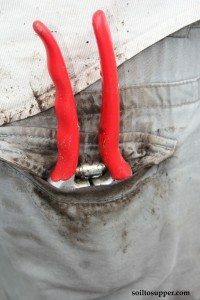 Always clean tools and wash pots before planting. I use Melaleuca or Eucalyptus Oil to clean tools and equipment. The best solution is healthy soil and biodiversity. Pruning – Prune shrubs and fruit trees to maintain good shape & suitable size to harvest from. Keep all green waste – It’s a resource!! Chop up and place in large compost bays or use mulcher to then reuse back on gardens. Check trellis and plants that are staked. Redo ties and for climbing plants check growth form regularly. Irrigation & Watering – Inspect irrigation systems and hose fittings. Ensure no leaks or blockage of pipes or drippers/sprayers. Drippers are best to save water and ensure moisture enters soil, not lost in atmosphere. Harvesting – don’t be afraid to do this! Harvest and enjoy fresh food and flowers before other critters enjoy them. Regular harvesting encourages more flowers and fruit, which is great when you’re growing your own. Share abundant crops with family and friends. OBSERVE your garden – Spend time in the garden daily which means you’re observing anything that needs doing, any problems. This is part of nurturing your garden. Organic products – organic slow release fertiliser, blood & bone, minerals, fine sugar cane mulch, liquid fertiliser, worm juice. Follow these simple steps and you’ll enjoy a healthy, thriving garden.